DISCLAIMER: While unapologetically acerbic at times, the content on this site is provided as general information only and should not be taken as investment advice nor professional advice of any kind, nor should it be considered as specific investment advice nor as a solicitation to buy or sell any securities. The ideas expressed on this site are solely the opinions of the author(s) and do not necessarily represent the opinions of the editor, publisher, or firms that may be affiliated with the author(s), editor or publisher. The author(s), editor, and publisher, unless specifically disclosed in the relevant post, do not have any market position, current or planned, long or short, nor have any financial interest in, nor receive any financial remuneration as a result of any investment, company, or advertiser, or other third party mentioned or referenced. All information is subject to change at any time without notice, we are not responsible for third-party information or services, including market data from any source. Any action that you take as a result of information, opinions, analysis, or advertisements (if any), appearing on this site, is your responsibility alone. Consult your investment adviser before making any investment decisions. There is risk in any investment, including traded securities, and all investment strategies have the possibility of loss. Past performance is no guarantee of future results. Incorporated by reference: Disclaimer – Google Finance. DomainMondo.com does not, and never has, published "sponsored posts." (mathematics, topology, analysis) An open and connected set in some topology. For example, the interval (0,1) as a subset of the real numbers. (biology, taxonomy) The highest rank in the classification of organisms, above kingdom; in the three-domain system, one of the taxa Bacteria, Archaea, or Eukaryota. [Noun] From Japanese 問答 (mondō). Noun - mondo (Zen Buddhism) A dialogue between master and student designed to obtain an intuitive truth. [Adverb] From the title of the cult 1962 Italian documentary film Mondo cane, Italian for "A Dog's World", from mondo ("world") and cane (“dog”). The film featured bizarre scenes, leading to English use of mondo as an adverb meaning "very, extremely" in mock-Italian phrases like mondo bizarro. (US, slang) Very, extremely, really. [Adjective] (US, slang) Big, large; major, significant. From Wikipedia: "The Mondō (Japanese:問答, Mondō: "questions and answers;" Chinese: wèn-dá) is a recorded collection of dialogues between a pupil and a Rōshi (a Zen Buddhist teacher). Zen tradition values direct experience and communication over scriptures. (Some teachers go so far as to instruct their pupils to tear up their scriptures.) However, sometimes the mondō acts as a guide on the method of instruction. One example of a non-Buddhist mondō is the Sokuratesu-no-mondō, the Japanese translation of the "Socratic method", whereby Socrates asked his students questions in order to elicit the innate truth from assumed facts." Domain Mondo provides a unique perspective, with news, opinions and analysis, on DOMAIN WORLD--internet, technology, investing--including: digital innovation; internet governance, technology trends, investing news, startups, and related issues. The editor is John Poole, developer, investor, domain name registrant. As editor, he authors, or curates, with full attribution, all content except that specifically identified otherwise, on Domain Mondo. 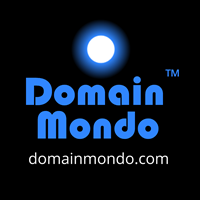 In addition, Domain Mondo may publish guest posts that meet its editorial guidelines and which are accepted for publication in publisher's sole discretion, subject to the publisher's right to revise and edit unilaterally, in its sole discretion, prior to publication. Said posts may be published with or without attribution, as the author may request, but must relate to the editorial standards aforesaid and in the DISCLAIMER above, and offered by said guest contributor for publication without compensation or remuneration of any kind. Anonymous guest posts are always identified as such in the post ("Guest Post by Anonymous"). In addition Domain Mondo welcomes tips, information, and ideas for future posts. All submittals should be sent via the email address that appears at the bottom footer of DomainMondo.com webpages.